Complete Details Of Ufone Call Packages, Hourly, Weekly and Monthly Call Packages For Prepaid & Postpaid. Today you will find here the complete details of the Ufone weekly and monthly call packages for prepaid & postpaid. Ufone has different weekly and monthly call packages that you can select according to your communication needs. Here is the complete detail about the Ufone Hourly Call Packages. Ufone has different hourly call packages that you can chose according to your communication needs. Here is the complete detail about the Ufone Daily Call Packages. Ufone has different daily call packages for its prepaid users that you can chose according to your communication needs. Fair Usage Policy of free minutes per subscription applies. The 300 minutes will be used to call on Ufone, PTCL and Vfone numbers. 0.13 + tax will be applicable for making each call. The Ufone location-based call packages include two different kinds of packages. You can find the below mention codes as per your city and can avail the Ufone call package for calling at U to U, PTCL and Vfone numbers anywhere in Pakistan. Ufone Nayi Sim Double Offer allows the customers to get double benefits on the purchase of new sim. Just purchase a new Ufone SIM dial *141# and on recharge of Super Card (Rs.520) or Super Card Plus (Rs. 599) get Double resources for the same price. On the recharge of Rs. 520 Ufone Super Card you will get 2,000 minutes for Ufone/PTCL , 300 Minutes for Other Networks, 2,000 MB Internet, 2,000 SMS. On the recharge of Rs. 599 Ufone Super Card you will get 2,400 minutes for Ufone/PTCL, 360 Minutes for Other Networks, 2,400 MB Internet and 2,400 SMS. Those Ufone customers who have not used their SIM since last 60 days are able to avail this offer. The customers of Ufone who have not done any activity on their sim can get the data bundle for the 30 days without any recharge. Customers can get 3000 U to U and PTCL minutes, 3000 MB of internet and 3000 SMS to any network in Pakistan. The incentives will be posted on daily basis such as 100 free minutes, 100 SMS and 100 MBs free Internet daily for 30 days. 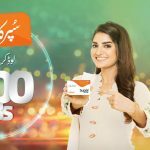 Ufone customers can avail the Sim Lagao Offer after dialing *5000#. Ufone Call Packages: Hourly, Daily, Weekly and Monthly For Prepaid & Postpaid.Complete Details Of Ufone Call Packages, Hourly, Weekly and Monthly Call Packages For Prepaid & Postpaid.